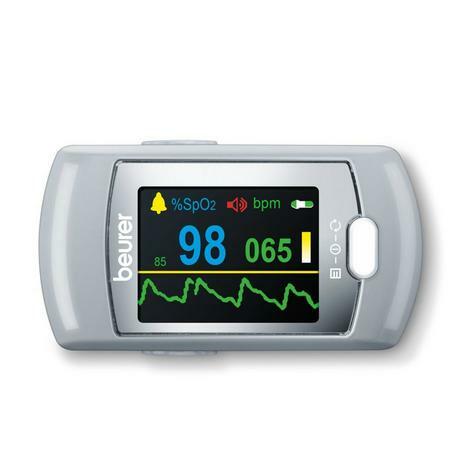 The Beurer PO80 Pulse Blood Oxygen Monitor is a simple and completely pain free measuring device showing a graphical display of arterial oxygen saturation and heart rate. 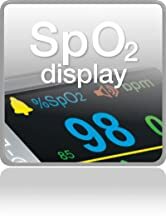 Oxygen saturation indicates the percentage of haemoglobin in the blood that is loaded with oxygen. Measurements are taken by two rays of light with differing wave lengths on the finger inserted inside the housing. 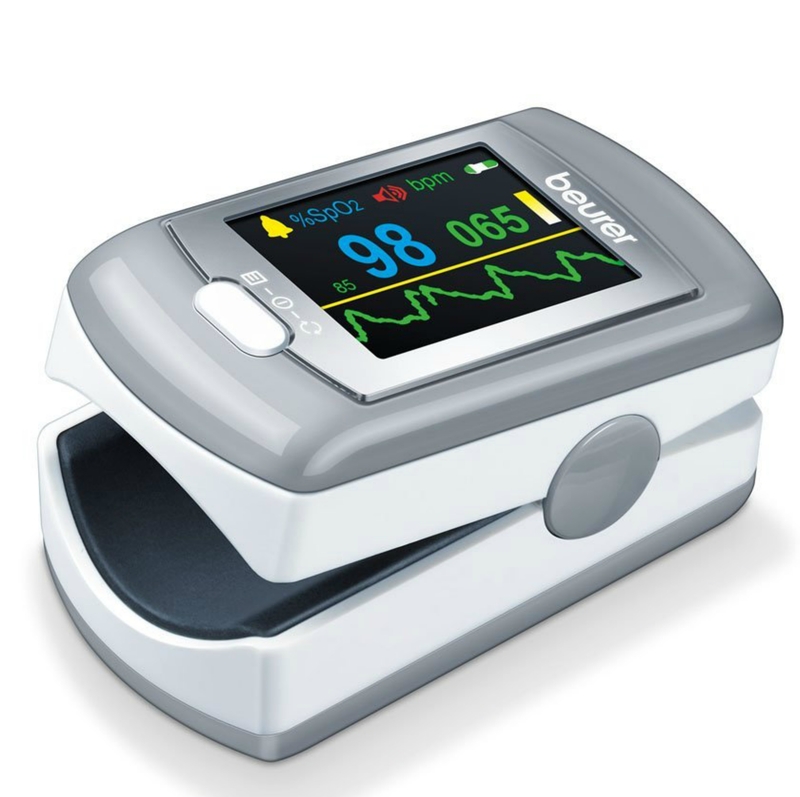 Can be used to detect if there are underlying illnesses such as; cardiac insufficiency, respiratory diseases, asthma or even heart failure. Suitable for sports at high altitudes for example: mountaineering, skiing and aviation sports. Particularly suitable for people with: heart failure, bronchial asthma and chronic obstructive pulmonary diseases. Features a built in rechargeable battery that can be topped up using the provided USB cable. 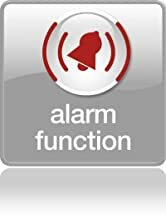 The alarm function can be individually set, and a continuous data recording of up to 24 hours can be made. The extra-large FL colour display offers four available viewing options and adjustable display brightness. 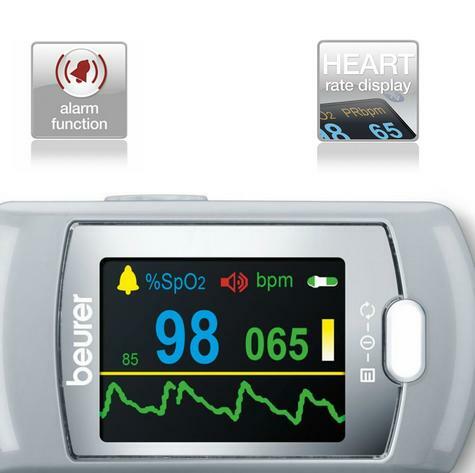 In addition, the Beurer PO80 includes software that enables all measurements to be stored on computer to display the long term situation. Presented in a strong metal storage case and complete with carrying strap, belt pouch, USB cable, USB charger and software. 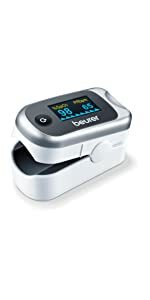 The Beurer PO80 Pulse Oximeter is a high quality monitor that is extremely lightweight and compact making it ideal for use both at home and on the move. 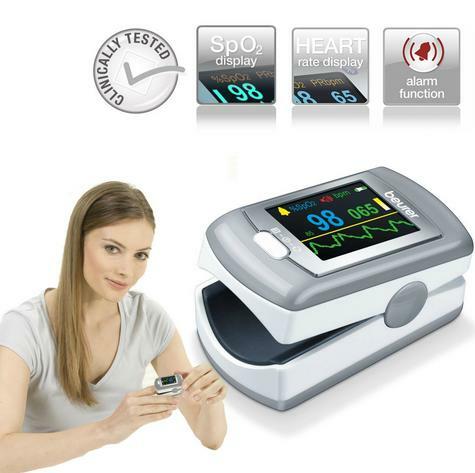 It is an invaluable monitor for those that suffer from heart failure, Chronic Obstructive Pulmonary Diseases (COPD) and Bronchial Asthma. An oximeter provides you with a measurement reading of your arterial oxygen saturation (SpO2) and heart rate. 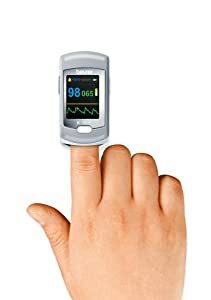 This device is supplied with a USB cable for transfer of measurements to your PC to allow you to track your progress and if required show your GP. 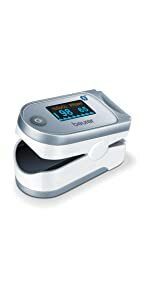 The easy to read display features 4 available views for different readings and the brightness can be adjusted with ease making this Pulse Oximeter suitable even for those with limited eyesight. If the values fall below or exceed your individually set alarm limits, you receive an acoustic warning.As standard the Beurer PO80 is supplied with a retaining strap and belt pouch as well as 2 x 1.5v AAA batteries. 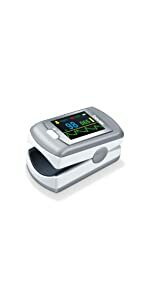 This oximeter automatically shuts off after use and clearly indicates when the batteries are low. Oxygen saturation indicates the percentage of haemoglobin in arterial blood that is loaded with oxygen. 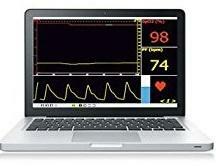 It is therefore an important parameter for assessing the respiratory function. 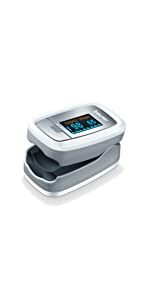 A pulse oximeter is useful for patients at risk such as people with heart disease or asthma, but also for athletes and healthy people who exercise at high altitude (e.g. mountaineers, skiers or amateur pilots). 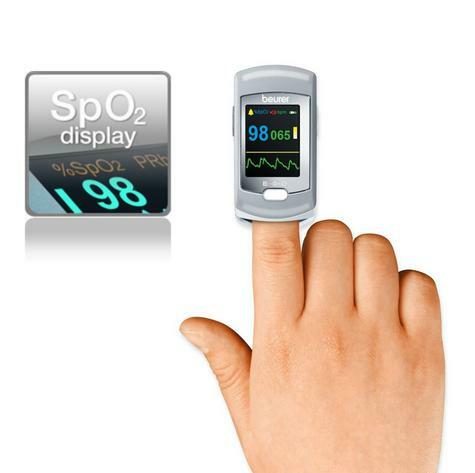 The pulse oximetry reading measures the oxygen saturation (SpO2). This is the percentage of haemoglobin molecules that are carrying O2 in the arterial blood. In healthy people, oxygen saturation is around 94% to 98%. The heart rate is also measured at the same time. If the values fall below or exceed your individually set alarm limits, you receive an acoustic warning. 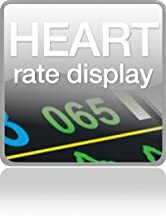 Heart rate is clearly displayed. 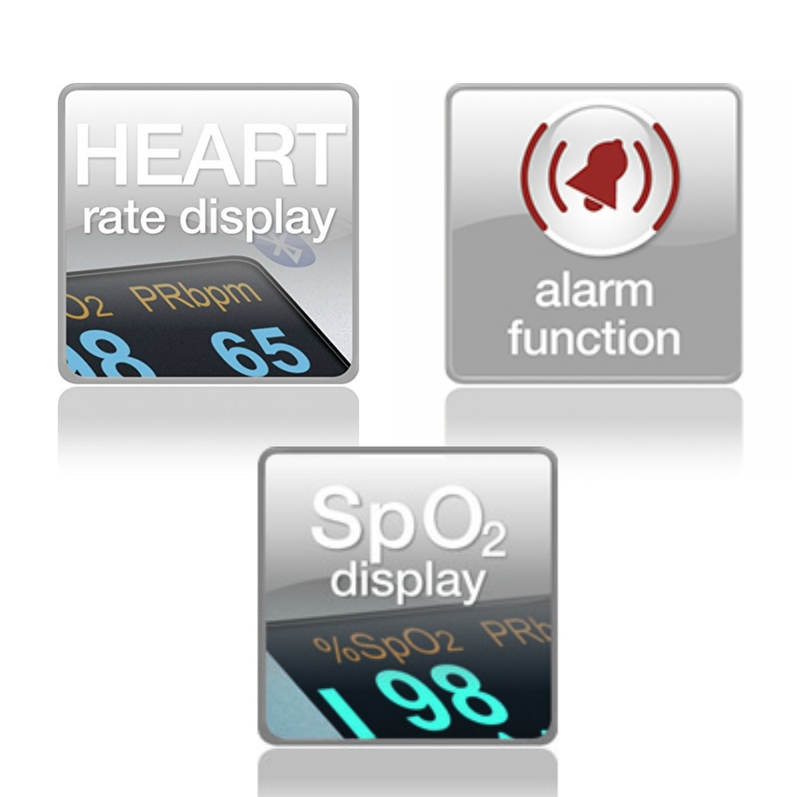 The oxygen saturation (SpO2), pulse rate (PRbpm), pulse bar and pulse wave are displayed. The pulse tone can also be switched on. Using the free SPO2 Manager software, you can transfer your measured values easily to your PC to view a detailed representation of your data and evaluate and even print this data. Operating systems: - Win XP - Win Vista - Win 7. Particularly suitable for persons with: heartfailure,bronchial asthma, chronic obstructive pulmonary diseases orsleepapnoea.